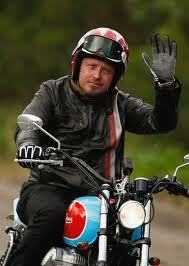 Charley Boorman: Ewan and I had gone through many different countries together including Canada. We travelled through the Rockies but there was a big fire so we didn’t actually get to see them due to the smoke! Back in 2004, I saw some adverts on TV for a new show called Long Way Round, featuring Ewan McGregor and his best friend Charley Boorman travelling around the world on motorcycles. I decided to give it a go – after all, I’ve been a fan of Ewan’s for year. Within minutes I was hooked, on the adventure, the fun and the camaraderie between the pair. Since then the intrepid duo have travelled through Africa in Long Way Down, and Charley has branched into solo projects, with Race to Dakar, By Any Means and Right to the Edge (By Any Means 2). 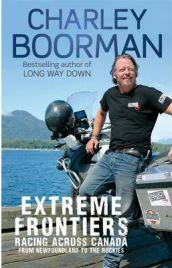 Now he’s back with a new adventure, Extreme Frontiers: Racing Across Canada. In November this year I was lucky enough to see Charley’s live show, in which he talks in detail about the trips he has undertaken.